this is the revolutionary guide to Self Hypnosis that is breaking all the rules! Discover the awesome power of Hypnosis as a way to happiness, love, money or anything else you might desire. This book is different, because it allows you to get started immediately, is uncomplicated, and has no "limits": can be used towards the achievement of ANY goal. 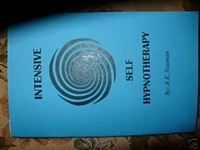 this book makes hypnosis FAST, EASY and FUN! Set up to get you started RIGHT AWAY, the same day you receive it! BY R. Neuman BRAND NEW/Softcover/44 Pages!! * NEW method to relax the body and mind more deeply than previously thought possible! * Go into a DEEPER trance than you've ever been! * Learn to place suggestions DEEP in your subconscious mind where they go to work immediately! * Hypnotize yourself for ANY purpose. Get ULTIMATE results right from home! 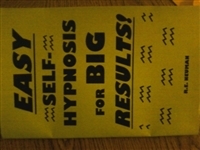 * FULL SCRIPT for easy, effective hypnotic trance EVERY TIME! * Many sample "Sub Scripts" (Hypnotic suggestions), plus how to word your own suggestions for MAXIMUM results! * COMPLETE SYSTEM for deep trance and hypnotic success...just follow the easy steps! 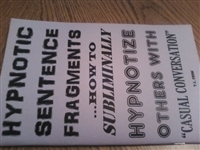 HYPNOTIC SENTENCE FRAGMENTS ""How to subliminally hypnotize others with casual conversation"""
By T.L.Crim THIS BOOK IS FOR CONSUMERS 18 YEARS AND OLDER, by winning this auction, you are stating you are of legal age to buy by Federal and state Law..
What exactly is a hypnotic sentence fragment? Hypnotic Sentence Fragments"How to subliminally hypnotize others with casual conversation"